High Energy Dance Music with Horns! On Anybody’s Guess Elixir is joined by Corey DiMario (acoustic bass), Garrett Sawyer (electric bass), and Matt Labarge (Fender Rhodes). Since its start in 2005, Elixir has evolved a sound that combines musical innovation with strong danceability, and has quickly become popular with dancers and audiences all over the country. 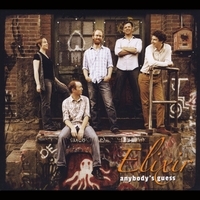 In 2008 Elixir released their first full-length recording entitled Super Tonic, which was followed by their critically acclaimed second album, Rampant, released in 2010. Anybody's Guess is the latest in the series and it just might be their best yet! For more info, a performance schedule and much more, please visit elixirmusic.com.